Posted on Thu, Jan 5, 2012 : 12:20 p.m. The abrupt ownership change at Live at PJ’s / Goodnite Gracie has left some on the local music scene hanging — unhappy about a loss of regular gigs, the handling of the change and, especially, an apparent reduction in live music in Ann Arbor. Despite the clubs’ shift toward more DJ music in recent years, they did still host live acts on a regular and semi-regular basis. And while the new owners have told AnnArbor.com they hope to continue some live music, it's clear their focus will be on DJs for the prime Thursday-Saturday nights. there really aren’t very many venues that support live music in town. Al-Saadi is also unhappy about the way the change was handled; rumors about the sale have been flying for weeks, but he said the outgoing management denied them and even asked him to remove a Facebook post saying last Thursday was his final date at the venue. Performers were notified of the change in a mass email this week directing questions about future bookings to the new management. Another regular event left hanging is the live-music happy hours. For the last couple of years, Live at PJ’s has hosted established local bands on Fridays from 6-9, in an event aimed at a middle-aged crowd. Chris Goerke of the country-rock band Drivin’ Sideways has lately been organizing the happy hours, which feature other bands as well as his own. The concept, with various people organizing it, dates back to the 1980s at different venues including Mr. Flood's Party, the Blind Pig and the Heidelberg Club Above. Goerke is talking to at least one venue about possibly continuing the happy hours, but he’s sad to leave Live, where the concept seemed to work out well for both the club and the bands. We went out with a bang New Year’s Eve. Randy Tessier, leader of the local band FUBAR and a longtime member of George Bedard & the Kingpins, also laments the loss of a venue for the event: "There's a history of happy hours, and it goes way back," he noted. "It's essentially always been a venue for some of the older musicians in town, and they're good ... It upsets me. "Where's a place for these older musicians and their fans?" Other regular live-music dates at the venue have included the classic jazz sounds of Phil Ogilvie’s Rhythm Kings, which moved its regular Sunday evening gig to Live/Gracie after the Firefly Club closed. The future of that series appears to be uncertain at this point. WEMU, the public-radio station at Eastern Michigan University, has hosted its 5:01 jazz series at the clubs on the first Friday of the month for several years now. The station has announced that this Friday’s show will take place at the Ravens Club on Main Street. It will feature the Ron Brooks Trio with guest vocalist Edie Hyde. WEMU General Manager Mary Motherwell said when the station was approached about bringing a jazz series to Goodnite Gracie, "We saw it as an opportunity to reach out to people who worked downtown by having a monthly 'after work' party on the first Friday. It started slowly but, within a year, we outgrew Gracies and had to move upstairs to Live. "The series has worked well there and our crowds have been steadily building. Like any live music series, it's had its bumps; we had a difficult time convincing them to put on more bartenders and waitstaff until just recently, so patrons often had to wait a long time to be served, but, overall, I'd say it's been a positive experience for WEMU. "And the 5:01 shows will live on—we're just not sure where." Economics clearly had something to do with the decision to sell the business. Derek Aldridge, the outgoing owner of the clubs, said the finances simply did not work for live acts. 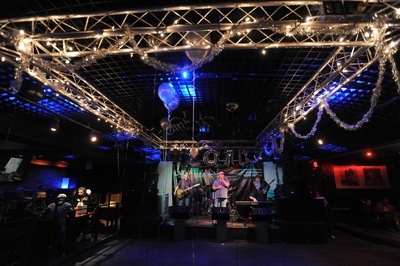 it’s tough for live music to survive in downtown Ann Arbor,” he said. DJs can be cheaper than live acts—although the bands at the happy hours were paid primarily on a pass-the-pitcher basis (plus a share of the bar take). Motherwell, Tessier, Goerke and Al-Saadi all expressed hope that things will all work out, either with different venues, the new ownership or some combination. Lizzy Alfs contributed to this story. Bob Needham is director of entertainment content for AnnArbor.com. Reach him at bobneedham@annarbor.com or 734-623-2541, and follow him on Twitter @bobneedham. Sun, Jan 8, 2012 : 11:58 p.m. I'm on the same page with Joe. Guy Hollerin's is a great place to fill the music void. The Chris Canas Band really enjoy playing at the venue. Maybe they will bring the Friday, After Work Blues &amp; Brews back. It was an early Happy Hour type event. You don't have to fight for parking and you can bring the family if you want to. Sun, Jan 8, 2012 : 8:09 p.m.
Like anything people want to see or do and most importantly pay for no matter the price; if there's a line around the block there's a reason for it; the same can be said for the opposite. Sat, Jan 7, 2012 : 2:13 a.m. The music at both these places was almost always universally bland...old white man blues bands and Cougar Rock. No loss to the local music scene to see them both go. Sun, Feb 5, 2012 : 3:06 p.m.
Now I understand your handle there Goofus. Fri, Jan 6, 2012 : 4:28 a.m. It's been a sad, long-term trend regarding the state of the live music scene in Ann Arbor. It seems almost Gypsy-like with the change in Happy Hour venues going on every few years in an effort to keep the older demographic hooked up with the established musicians that have been in town for so many years. Actually, many of us have witnessed one another grow up into the working world, raising families and whatever else life presents. Some have left town, some are no longer with us. These Happy Hours do provide a sense of community for the musicians and attendees that remain, which is undoubtedly why individuals like Mr. Goerke continue in their dedication to find establishments that will allow the events to continue. I and many others certainly appreciate their efforts to truly keep the music &quot;LIVE&quot;. Thu, Jan 5, 2012 : 9:06 p.m.
Fri, Jan 6, 2012 : 12:16 a.m. Confused about the name. Is it Local Brews and Local BLUES? That would make more sense. Thu, Jan 5, 2012 : 11:02 p.m. I always love being a part of your series! Looking forward to Feb. 25!!! Thu, Jan 5, 2012 : 8:59 p.m. I love how there is no mention from Laith of thanks to the people who kept him playing there for the past years. I would stop in there pretty regularly on Thursdays and he would be down there playing to 10,7, and sometimes 5 people. Every now and then he'd have a halfway decent night but so often it'd just be dead. I would think to myself that the people who are hiring him must either be the most loyal people in the history of the world or the dumbest. Why does he think he is so special? In today's world I know that if the company I work for sells or closes it's doors tonight, I'm not going into work tomorrow. Welcome to 2012, that is just the world we are in. And somehow how he is upset that he was asked not to announce the business dealings of others on his Facebook page. Not only that, he was asked by the people who were paying him at the time. Give me a break. Seriously? Would this fly in your job? Thu, Jan 5, 2012 : 8:47 p.m.
Fri, Jan 6, 2012 : 4:03 a.m. Many good times back then in A2 Mr Smith. Thu, Jan 5, 2012 : 8:51 p.m.
Wow, thanks for the added perspective! Thu, Jan 5, 2012 : 8:22 p.m. So, musicians need to perform almost for free in order to have the chance to perform at all? Music never was much of a livelihood. Sad. I wonder if the Musicians' Union is still having an impact on all this. Back in the day, bars and restaurants could not afford live music except on really crowded nights ... because the union forced the musicians to charge full rate no matter what. I remember the union threatening to have the Teamsters prevent delivery of beer, and so on. Passing the pitcher wasn't an option, although it occasionally was under the radar at certain establishments. Thu, Jan 5, 2012 : 7:31 p.m. This is just a sign of a trend that's been going on for over a decade. DJs and beat-oriented (samples) music will continue to dominate the music scene. DJs occupy a MUCH smaller space financially and logistically. People with &quot;younger&quot; tastes tend to have a smaller attention span and prefer a 3 minutes pop song that has the &quot;coolest&quot; video. Is it cool to play an instrument anymore? Fortunately we still have the Ark, Kerrytown Concert House, the Blind Pig, UMS.org events in Ann Arbor and Woodruffs in Ypsi. I still have to make it Detroit (i.e. Cliff Bells, Virgil Carr, Baker's, Detroit Music Hall, Detroit Jazz Fest), Ferndale (Magic Bag), Auburn Hills (Callahan's) to see more rootsy, improvisatory music. Does anyone have other recommendations for venues? I am curious about this new format to the Elks Lodge w/ jazz and soul food. Hopefully it will get some support and be a safe haven for jazz musicians for times to come. As a musician who has played in venues around SE Michigan, keep supporting live music. Boycott your DJ! Fri, Jan 6, 2012 : 2:45 p.m.
Thu, Jan 5, 2012 : 6:39 p.m.